I have always been slightly obsessed with scents. I could spend HOURS in a candle store (actually... I HAVE spent hours). And, those candle parties that used to be the rage (do they still have those?) used to be dangerous to my credit cards. And, I never REALLY brought a paycheck home when I worked at Bath & Body Works. I kind of worked for smelly lotions, gels, candles, and air-fresheners. So, when I received an offer of trying out some of the new Glade limited edition Winter Collection I didn't hesitate for a moment. I have been in holiday heaven ever since. 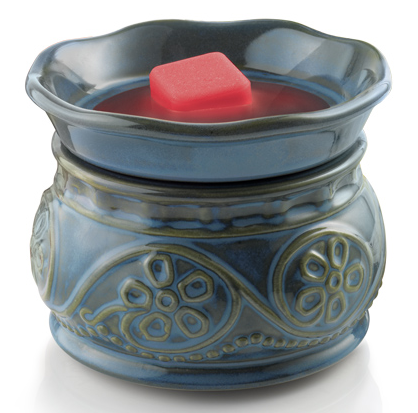 I've mainly been using the Wax Melt Warmer with the Apple Cinnamon Cheer melts. Oh. My. Goodness. YUM. Fruity spicy smells are definitely a favorite. We are an artificial tree family. While I like the artificial tree... I always miss the fresh evergreen smell. I've tried oils, sprays, candles, specially made tree ornament things... nothing really quite did it for me. Let's just say... not all evergreen candle scents are created equally... and I don't know how some things are allowed to be labelled with evergreen, or pine, or spruce. Ick. But, this afternoon I lit my Glade Sparkling Spruce jar candle. And you know what? It actually smells like Christmas tree!!! I think I'm going to run out and stock up on these jar candles just so I can store them for years to come. It just smells like Christmas. I also have to say... I love the Frosted Berry Kiss Premium Room Spray. (Even the girls love giving the bathroom a little squirt before they leave!) The only product I didn't love? The Frosted Berry Kiss/Pure Vanilla Joy Scented Oil Warmer Customizable. And that is only because Vanilla is just not my thing. (It makes me a little ill I'm afraid.) But if you like Vanilla... you will LOVE this. It switches between the 2 scents to always keep it new for your nose. You never really tune it out. (What IS that called for your nose?) I have to say... I'm just THRILLED that it's also available in an Apple Cinnamon Cheer & Sparkling Spruce combination. What can I say? Smells. They make me happy. Is there a smell that brings you joy? A smell that brings out a memory? A smell that just makes you happy? Glade put together some amazing stats on The Power of Scent!